TORONTO - The federal and Ontario governments are set to square off in the province's top court this week over Ottawa's climate change law in a fight experts say is as much political and ideological as it is legal. 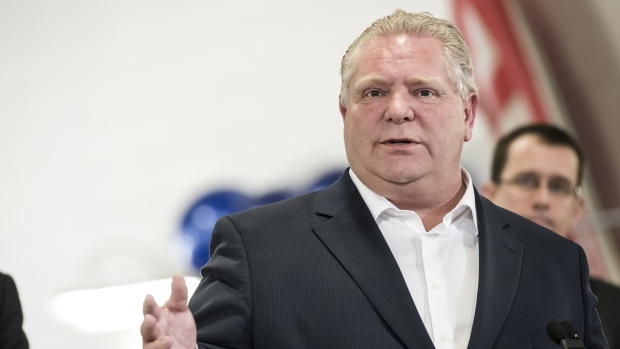 Ontario's Progressive Conservative government under Premier Doug Ford - supported by like-minded premiers in Manitoba, Saskatchewan and New Brunswick - has denounced the Greenhouse Gas Pollution Pricing Act as an illegal tax grab that will force up the price of gasoline and heating fuel. Like Saskatchewan did recently - a decision there is pending - the Ontario government is asking its Court of Appeal to decide whether the federal law is constitutional. For its part, the federal government insists it is responding appropriately to an issue of national concern - climate change. The legislation, the government says, aims to “fill in the gaps” where provincial measures aren't up to snuff. Ontario, however, insists the scheme enacted under Liberal Prime Minister Justin Trudeau is an unconstitutional tax grab - even if Ottawa does have the authority to tackle the 33 pollutants currently covered under the act.